Latte from Fifty / Fifty. Yelp photo by Nance L.
One of my fab Twitter pals alerted me to the opening of ~FIFTY / FIFTY COFFEE AND TEA~, a new café on Geary in the Inner Richmond/Laurel Heights area. On tap: Ritual coffee, bubble tea, loose teas, tea smoothies, and baked goodies from Dynamo Donut and Devil’s Teeth. Reportedly it has a cute look, and Wi-Fi. Open daily. 3157 Geary Blvd. at Spruce, 415-684-8886. The nixed Coffee Bar space in SoMa is going to be ~GAS LAMP CAFÉ~, according to some permit action. 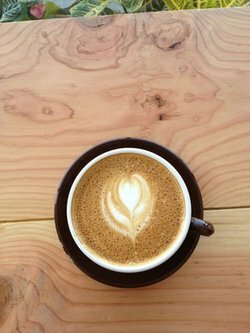 The website mentions Blue Bottle coffee and a May opening. 1599 Howard St. at 12th St.
Eater announced that ~FOURTH WAVE COFFEE~ on Polk has closed. 1356 Polk St. at Pine. Oakland is going to host the largest ~BLUE BOTTLE~ location yet: Scoop mentions the upcoming location is the historic W.C. Morse building, which dates back to 1905. One bonus to the usual offering: James Freeman is hoping to create a home espresso machine showroom and repair shop. Love this. Look for an opening this year. 4296 Broadway at 42nd, Oakland.